After a month spent touring Europe, Morrissey and his band took another month to tour the UK and Ireland. The British and Irish fans had been neglected on the previous Maladjusted tour when Morrissey played only two dates in the UK and a handful in mainland Europe. Overall Morrissey seemed in a great mood throughout these dates. He was very talkative, much more than in most European countries where he probably felt the language barrier. Performance highlights included a dramatic performance of "Meat Is Murder" which probably converted more than one fan to vegetarianism. Speaking of vegetarian food, a banana was still used as a prop, waved at groin level during the '...urinal' line in "The Boy Racer", then tossed into the audience. Other than a banana, the fans attending the concerts on this tour were given many t-shirts. Morrissey often changed three, four or even five times within the same gig, and each time he threw the sweaty t-shirts to the fans who would then fight for pieces like wolves over prey. He usually wore one or two West Ham Boys Club shirts, a Canning Town Sauna Club shirt, occasionally a Mexico shirt. Other than that, Morrissey often wore designer paint splattered jeans held by a belt with a buckle showing the mexican flag. After boxing in 1995 and swimming in 1997, Morrissey seemed fixated throughout this tour with the Cockney Rejects and their favourite football team, West Ham. He wore shirts of the latter team, and the intermission music played before each concert included three songs by the Cockney Rejects. Never before had a band been featured three times in the intermission set (scroll further down for track listing). Personnel: Boz Boorer, Alain Whyte, Gary Day and Spike Smith. Spike was getting better as time passed, but Spencer Cobrin, Morrissey's previous drummer, was missed by many. 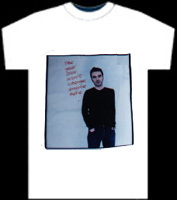 - White t-shirt featuring boxer Kenny Lane on front and tour dates on back (5 October to 6 December 1999), �. View. 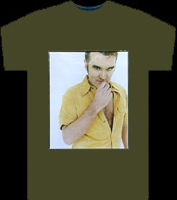 - Tan t-shirt, tour dates in yellow on back (5 October to 6 December 1999), �. View. 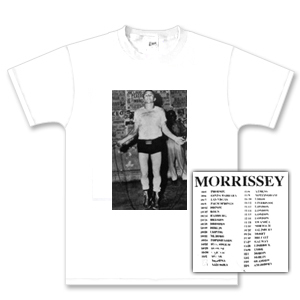 - White t-shirt of scruffy looking Moz, hands in pockets, 'Moz' on shirt arms and "The year 2000 won't change anyone here" over photo, USA dates on back (10 to 20 December 1999), �. View. 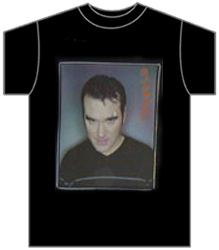 - Black t-shirt of mean looking Morrissey, dark shirt with light horizontal stripe, word 'Esteban' over photo, �. This was sold out one third into the leg. View. 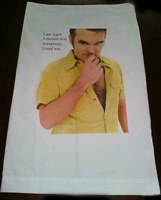 - From Swansea on, a pillowcase was put on sale for �with the words "Last Night I Dreamt That Somebody Loved Me" on it. View. - Yellow Morrissey condoms were added to the merchandise table in Derry, they were sold 1�. View. 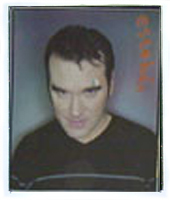 - Poster of mean looking Morrissey, dark shirt with light horizontal stripe, 3�. View. 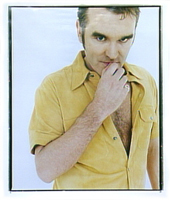 - Poster of Morrissey in yellow shirt, 3�. View. Morrissey walked on stage at the end of the drum intro to his own song "The Operation". The typical setlist of the British and Irish dates of the Oye Esteban tour included 17 songs. On a few occasions one title was skipped or dropped so a few cities got 16 songs. The selection was very similar to that of the previous European leg. The highlights were the live debuts of "A Swallow On My Neck" and the Smiths-era "Half A Person" at the very end of the leg. Overall the content didn't vary much. At best the order was scrambled from one night to the next. The sets usually opened with energetic numbers "You're Gonna Need Someone On Your Side", "The Boy Racer" and "Billy Budd", and the encore was always "Last Night I Dreamt That Somebody Loved Me". In between that, regulars were "Reader Meet Author", "Is It Really So Strange", "Hairdresser On Fire", "November Spawned A Monster", "Speedway", "Trouble Loves Me", "Meat Is Murder", "Now My Heart Is Full", "Alma Matters", "Tomorrow" and "Break Up The Family". "Sunny" was played regularly at the beginning of this leg, then gradually neglected in favour of "Roy's Keen". B-side "Lost" was performed on the first ten dates but was dropped permanently when "The Teachers Are Afraid Of The Pupils" was added to the bill in Derry. The latter was performed for the remaining dates until the last two when "A Swallow On My Neck" then "Half A Person" were introduced, in Glasgow and Aylesbury respectively. Morrissey was at his most comfortable before British audience so he made even more lyric changes than he had done earlier in the year in the USA and mainland Europe. Many previously heard changes were still done, some were transformed, and quite a few were introduced. He did this to accentuate the self-deprecating tone of the songs, to have fun, or just to spice up his words with sexual innuendo. Morrissey was at his most playful with his older material, and "Hairdresser On Fire" is the best example. The Oye Esteban version started with the alternate lines "Where is London, so much for London" and other occurrences of "here is London" were replaced by "so much for London" as well. Morrissey sang "psychologically shave me", "stoned around Sloane Square", "when he said I'm gonna screw you, I really felt happy for you", "home of the flash, outrageous and free" or "home of the rash, outrageous and free" and finally "too busy to kiss me". He also replaced "you are repressed but you're remarkably dressed, is it real?" with "you might be depressed, but you're remarkably dressed, and that's all you need". He even changed the latter at least twice to "I might be depressed, but I'm remarkably dressed, and that's all I need", a change that would become more common on the upcoming tours. In "Break Up The Family" Morrissey replaced "I want to see all my friends tonight" with "I want to be with my friends tonight". He also replaced "to move away from those younger years" and "...darker years" with "to move away from those awful times". "I'm in love for the first time" was often - but not always - changed to "I'm in love for the last time". He also sang "I'm so glad to be older" on a few select occasions. The 1999 performances of "Meat Is Murder" were always very heartfelt and powerful. The Oye Esteban tour arrangement of this song was very dramatic. Morrissey always sang it under red spotlights, with a lot of emotion in his voice and ended it with the alternate question "And do you care how animals die?" In "Is it Really So Strange" Morrissey always changed "I found a tiny house" to "I found a modest house". He sang "Oh yes you can chin me, and you can shin me, and you can dislocate my shoulder blade but you won't change the way I feel" for the first few dates. This then became "Oh yes you can chin me, and you can shin me, and you can break my spine" for a few more dates, then "Oh yes you can chin me, and you can shin me, and you can break my teeth" for the rest. The funniest change was still the one to "I lost my wig in Newport Pagnell". The final line was changed to "I can never go back home alone" on a few rare occasions. In "November Spawned A Monster" Morrissey didn't sing "You're just so ugly, you're so ugly" and "Oh hug me, please hug me" as much as earlier in the year. In the same vein, he sang "I'm so ugly" and "could you even bear to kiss me full on the mouth or anywhere" only once, or perhaps twice at best. Meanwhile the change to "but she'll be walking your streets in the clothes that she went out and stole for herself" was now almost standard and the change to "a symbol of where mad, mad lovers must always draw the line" was becoming more common. Boz used a recorder during the song's bridge. In "You're Gonna Need Someone On Your Side" the change to "Someone kindly told me that you've collected... Stanley knives" wasn't done anymore. Instead Morrissey sang "Someone kindly told me that you've collected... very sharp knives" for a few dates, then changed it to "Someone kindly told me that you've wasted... every good thing in your life" for a few more. This evolved successively to "Someone kindly told me that you've blown away... every good thing in your life" then "Someone kindly told me that you've thrown away... every good thing in your life". He did "Oh you don't need to look so peeved" on and off, and when in a playful mood, he sang "you're gonna need someone on your snide". The song always segued in quick succession into "The Boy Racer". In "Tomorrow" Morrissey usually replaced "something that you never do" with "...that you'll never do", "I won't tell anybody" with "I won't tell anyone" or "I will tell everyone", and the second occurrence of "through my shiftless body" to "through my miserable body". Only once or twice was "Billy Budd" updated by changing a line from "now it's 12 years on" to "now it's 18 years on". The Oye Esteban tour version of "Speedway" still lacked the album version's three opening lines. The line "it won't work" was always changed to "it just won't happen". On most dates Morrissey sang "you won't smile until my (or this) ugly mouth gets shut good and proper". This was followed by a shout of "Yes!" instead of "...forever". In "Now My Heart Is Full" Morrissey dropped the word 'puny' in "just some rain-coated lovers' puny brothers", thus making the vocal delivery easier. The line "I'm tired again - I tried again" was usually changed to "I was tired again, I tried again". Morrissey also often changed "jammy Stressford poet" to the more autobiographical "jammy Stretford poet". In "The Boy Racer" he sang "I'm just too good looking" a few times and mumbled, breathed loudly or made funny noises instead of singing the line "I'm gonna kill him". A banana was again waved at crotch level during the 'urinal' line in that song. The only constant change in "Reader Meet Author" was "you hear the way this sad voice sings". The change to "have you ever escaped from a Ormskirk life" was a one-off and "I'd be the first away because I'm that type" wasn't done anymore. On a few dates Morrissey ended the song with "thank God, thank God, more lies" or "...for lies" instead of the usual mumbling. As in previous live performances of "The Teachers Are Afraid Of The Pupils", only the first verse was done, followed by the litany of "to be finished would be a relief", so that the song would not last 10 minutes like it does on the album. Just as he had done on the 1997 Maladjusted tour Morrissey replaced the line "I will be set alight" in "Roy's Keen" with "but that's alright" and skipped the eight lines that followed. On most nights he sang "we've never seen a keener midfielder" and "well it's here right under your nose and you just can't smell it, can you?". He replaced "Smiling on time" by "frowning on time" at least once. On a few occasions in "Alma Matters" he sang "it's my life to end my own way", "it's my life to destroy my own way" or "it's my life to wreck my own way". He also constantly sang "So, the life I have blown away" or "...I have thrown away" instead of "So, the life I have made". In "Trouble Loves Me" he replaced "otherwise hold me" and "otherwise kill me" respectively by "oh somebody hold me" and "somebody kill me". He also sang "which is only the way it should be" in most if not all performances of the song. Strangely in "Sunny" Morrissey changed a line to "they're..." or "you're not forgiving me, and I'm not even wrong". He also sang "tell us all how things are no better" instead of "tell us all how things are so much better". In "Swallow On My Neck" Morrissey changed the whole chorus to "But then you drew a swallow on my neck, there was no more to say, you drew a swallow on my neck, and from then on I knew". Audience recordings of three of the four London Forum shows can be tracked down on bootleg DVDs. There are for the first (13), third (15) and fourth (16) shows. Neither are good visual souvenirs of the Oye Esteban tour because the recorder had to occasionally hide the camera from security and the footage is therefore sometimes obstructed. Non-completists may want to look instead at what is available for the other legs of this tour. A recording of the second (14) show at the same venue is rumoured, but unconfirmed. Audio bootleg collectors are spoiled for this leg of the Oye Esteban tour because, even though nothing is available from the soundboard/mixing desk, very good audience recordings of eight dates and quite good recordings of another handful are in common circulation. Top of the list are the recordings available for Nottingham, London night 1, London night 3, London night 4, Norwich, Salisbury, Cork and Dublin. The recording quality for these is almost as good as soundboard. The Dublin recording captured very well the energy of the audience. The latter dates were given more or less the same setlist except for Cork where "The Teachers Are Afraid Of The Pupils" and "Roy's Keen" had been introduced into the set instead of "Sunny" and "Lost". The audience recordings available for London night 2, Limerick and Aylesbury are also quite good. Of that lot the most interesting has to be the latter one because it features the only circulated recordings of "A Swallow On My Neck" and "Half A Person" for this leg (however please note that recordings from later legs are also circulated for those two songs). Completists will then be looking out for average recordings of Liverpool and Galway. Belfast is also available, and the quality is rather good, but only the first half of the show was taped. Recordings of Leeds and Derry are also out there, but they are not shared much at this point in time.